Finally, I have a delicious recipe -- that you don't have to eat with a spoon -- for all those little ones without teeth. I keep talking to parents whose 12, 13 even 14 month olds still don't have teeth. They really want to move beyond purees, but need a recipe soft enough for their little ones to chew (or gum). These spinach gnocchi balls are so heavenly that Kenya only got his mitts on 8 or so before the grownups had eaten them all up! This is a recipe that Popeye would be proud of. Packed with spinach and creamy ricotta, these little morsels are like soft pillows_ delicate and so easy to make. You could even serve them with a little red sauce, but for easier cleanup, I highly recommend just a little sprinkle of parmesan cheese and that's it! 2/3 Cup Parmesan Cheese, plus 2 tbsp for sprinkling before serving. 1. Defrost the brick of frozen spinach (you can also do this in the microwave). 2. Squeeze ALL (and I mean ALL) of the water out of the spinach in small handfuls (I use my hands and do it over a bowl to make sure I don’t lose any spinach). 3. 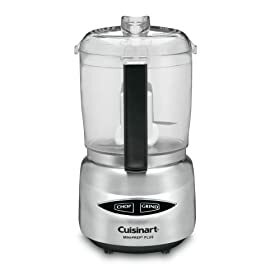 Place all of the ingredients in a food processor and pulse. You want to make sure the spinach is in tiny pieces and the mixture is thoroughly combined. 4. Dust your hands with a little flour so the mixture doesn’t stick to your hands. 5. Take 1 teaspoon of the spinach mixture and roll into tiny balls. Place on a plate covered with waxed paper or parchment. 6. Bring a large pot of water to a boil for cooking the gnocchi. 7. Add the gnocchi to the water in batches and cook for 3 minutes or until they rise to the surface. 8. Using a slotted spoon, remove the gnocchi to a plate or bowl. 9. Sprinkle with parmesan cheese, cool and serve. *After step 5, place on sheet tray and freeze for 30 minutes. Transfer to a ziploc bag, label and freeze up to 4 months. When ready, thaw to room temperature and follow steps 6-9. What a mess! Spinach mush. I loved your salmon cooking method, but this one was a clunker. Could I have done something wrong? My hands were a mess. Thank God my daughter was asleep. If she were next to me, there's no way I could've made this. Same thing happened to me. I'm so frustrated! Just discovered your site, looks fantastic. Can these spinach Gnocci be frozen? Hi, i tried making this gnocchi but found that the little balls didn't hold together too well. they were very soft and barely held their shape. i followed the recipe exactly. how soft are they supposed to be? my son wouldn't touch them, but he is going through a picky stage (he's 12 months). i pinched off some and put it in his mouth, but he was still not interested. any thoughts? I tried this recipe for dinner tonight. I followed the instructions exactly but the balls fell apart after approximately a minute in the boiling water. I'm not sure why this happened and I am hoping you have an idea. I would like to figure out the problem and try once more as the recipe sounds great. Thanks so much for your time and thanks for all the recipes you are sharing. LOVED this... we could not stop eating them ourselves! Perfect texture! Also - love that you have some recipes for kids with no teeth - my LO refuses baby food - so we've been doing finger foods for awhile now. At 10 months he still has no teeth - so this was perfect! what am i missing? how is the spinach mix and gnocchi combined? You are not missing anything, take all the ingredients and put them in the food processor and pulse to combine. The gnocchi is what the spinach mixture is called when you form them into balls and place them in boiling water to cook. Gnocchi is the name of the dish. I made them tonight for my 11 month old tomorrow's lunch. They came out perfect. I dint have ricotta cheese in hand, so used cottage cheese instead. Cant wait her to try these. I also tried banana bites and tex-mex rice cakes from your website. My husband loved the rice cakes and wanted them again today for evening snacks. Thanks a ton for posting these wonderful recipes. I put these in my 4 year old's lunch for tomorrow. I hope he likes them. They came out really good and look quite tasty. I would try some, but, I'm still full from dinner. Thanks for a great recipe! I just made these and my girls are still taking their nap. It is taking all I have in me to not eat every single one of them, they are so good! Thank you for coming up with recipes that not only babies like, but adults as well. It saves me a lot of time to be able to make one meal for the whole family. My 5 year old son and I made these together tonight, and they were terrific! We made traditional gnocchi, too, but both he and our 1 year-old preferred these. Based on the reviews, I added 1/2 of a cooked sweet potato to the mix to help hold them together. They cooked up perfectly. Tried to make these for dinner tonight by myself with two little ones and it took me about 2 hours. :( By the time they were finished the baby (11 months) was asleep and my 3 year old refused to try them. So sad. At leas half of the batch didn't go to waste, I chowed down on them. So yummy! Can't wait for baby to try them for lunch. yep really good content ...for sure.... it's awesome to see that your posting some unique stuff here ! For people looking for a similar but maybe easier spinach ricotta recipe, this weelicious recipe for spinach ricotta bites is one of my favorites and it freezes really well. I make a batch every other week and freeze them, then defrost a couple for daycare lunches. YUM! I am excited to try this recipe! Does it make any difference if I use frozen chopped spinach in a bag? I generally buy the bagged on at TJ. Thanks! PS: Your blog is really fabulous!!!!!!! That's a great question. It isn't a great idea to thaw and re-freeze foods depending on the food. But! Because the spinach is thawed, then prepared and mixed into a new dish, it is okay to re-freeze it. Frozen spinach has already been cooked once which is an important factor in re-freezing foods. Hi. Made this recipe out of your cookbook. I substituted bok choy leaves for the spinach, cottage cheese for the ricotta, and quinoa flour for the all purpose flour. So I guess it wasn't really the same recipe? Anyway, thanks for the idea and the guidelines. My 12 month old loved them. Looking forward to trying these! A good trick that I learned from Food Network (I think it's a Rachel Ray trick) is to put your thawed spinach into a clean dish towel (smooth cotton seems best), roll it up like a tootsie roll in a wrapper, and twist the ends HARD (with the spinach inside) to remove the moisture. Voila, dry spinach! * I have a green cotton dish cloth that I reserve for this purpose. I just tried making them and they completely fell apart :( I squeezed all the water out!! What did I do wrong? Did you really really squeeze the spinach? I used a pasta strainer, put it in there and then pushed down with a dish towel. I did this a couple times until it was super super tight, confined, and dry (you can even re-break it apart and re-squeeze just to be sure). Also, maybe next time refrigerating the balls for half and hour or so? I also saw that someone mentioned a little extra flour helped so when I added the flour, I didn't worry to much about making it super level. Good luck - they are worth the hassle. Georgiana - Yes, cooking it for a long time is what delpoves that slightly sweet, deep flavor which is why using a slow cooker is so amazing! You don't have to babysit it on the stove top :D I looked up pictures of passata to try and get a better idea of what you have to work with. It looks like our \"tomato sauce\" which is just a little more uniform in texture and a little more liquid than crushed tomatoes. It probably will work for the sauce, it will just be rather smooth. Of course, you'll still want to add the tomato paste/puree as I do in this recipe. If I were you, I would use all three, one large can of passata, one large can of chopped tomatoes, and one small can of tomato paste... and then try to use the immersion blender again, despite its messiness ;) Good luck, I hope you achieve your ultimate sauce!! Can I use fresh spinach ? If so how do I cook it? Can you explain how I can freeze it? I just made these for my 8 month old and she loved them! One question though...are they supposed to be super mushy? I boiled them for 3 mins and they were floating in the pot but they are very very mushy. They are pretty soft, which makes them perfect for little ones! These were really good! They were incredibly sticky so I put the dough in the fridge overnight before I rolled it into balls. I'm not sure if that helped but it didn't hurt. They were so squishy that my 7 month old couldn't pick them up without squishing them to pieces so I fed them to him with a spoon. But they were tasty and fun for him to eat. I would love to see new recipes for my 12 month old that the whole family can eat! Check out pureelove.com There was a couple recipes you and your baby might like. I just made the turkey meatballs and they were very good. Sorry I can't post a link! What would you recommend instead of ricotta? My little one has a cows milk allergy. They eat goats cheese could that be substitutes? Goat cheese should work if it is on the more wet side. The moisture in the ricotta helps these stick together! New grandma, want my grandchildren (TODDLER'S NOW) to be more healthy. This recipe is so disappointing. It should be modified. My little girl was so excited to have these for lunch tomorrow. All they did was disintegrate into the water. Has the issue of them falling apart been addressed? I see a lot of similar comments and the same thing happened to me. I even rung the spinach out very well. Has this recipe been revised? If you boil them frozen they fall apart. You have to defrost them for a min prior. I popped in microwave for a bit then boiled and they stayed together, My 9 month old loves it! I have an 8 month old daughter who is teething and would like home made recipes for her please. Has anyone had the problem of cooking after being frozen? Mine completely fell apart and liquified. When I cooked them fresh they where perfect. I froze mine uncooked. To cook I wrap the gnocchi in an aluminium foil pouch and bake for 30mins at 350F. This way the gnocchi are still round, not too mushy and my 12 month old baby can still pick up with fingers or fork. I was SO hoping this recipe would work for me. My daughter LOVES cheese and I thought she would definitely eat these. I squeezed the spinach for so long, then rolled them in paper towels and kept squeezing some more. Then I proceeded to squeezed more. When I tried to ball them, they were very sticky and mushy. I used A LOT of flour to form \"balls,\" (they pancaked as soon as I set them down), then when I boiled they turned the water green and fell apart. When I scooped out the remains after three minutes, they were just mushy blobs. I tossed the rest of the \"dough,\" and I hate wasting that much food, but it was clear this plan was derailed. I tasted one of the boiled ones, and it was a weird consistency; nothing like gnocchi. If anyone can suggest a veggie recipe w/ pasta or cheese that is easy to follow and turns out nicely, please suggest! Thanks. Ok- I've made these twice now. First batch came out the best. They will fall apart &amp; turn water green if you cook too long. Only cook these for 2 min. Next- I used extra flour to try &amp; make them a bit more solid and it didn't do much but make them less tasty. I think getting the right kind of ricotta &amp; blending it COLD so it's harder when cooked is the way to go. Also, make sure spinach is totally defrosted and squeeze really well. I froze a few cooked and to defrost either just brought to room temp or microwaved and that worked just fine. When made correctly (I think) they are pretty soft but do hold their shape. I feed then to my daughter with a fork but she LOVES them, they are a great way to get her to eat spinach! Tried these last night and though I, too, made ricotta spinach soup when I tried boiling the first batch, the rest turned out great when I baked them at 350 for 30 minutes. I think even if I had been able to boil them they would have been soggy. The texture of the finished product after baking was perfect for my new self-feeder and they tasted so good it was hard not to eat them all myself! use full fat ricotta that's not watery, like some brands and types can be. lightly coat the balls with flour or semolina and refrigerate for at least a few hours - this helps create a protective but delicate seal which will prevent them from falling apart and getting mushy when boiling. Don't freeze them though; this somehow messes with the texture and consistency of the little guys when they go from extremely cold to extremely high temperatures. When they float (and look fluffy:), dump them straight into a pan of sizzling butter and sauté until they're coated. So good with extra parmesan and a little lemon juice! what can I do if I can't find frozen spinach?? The only spinach found in my country is fresh... what do you suggest? This recipe needs the frozen spinach because it helps hold together the gnocchi. You could try blanching or steaming the fresh spinach to get it wilted and then squeeze out the excess moisture. I haven't tested that myself, but I think it would work. They came out perfect!!! I made sure to squeeze the life out of the spinach and the balls came out perfect. Now I just hope my baby girl will like their taste and if not I will eat it. The balls do not hold their shape, they fall apart. There seem to be a lot of comments to this effect. So what is the bottom line, i.e., how do I prevent this from happening?. All of the balls melted apart when I put them in the pot of boiling water! How do I prevent this from happening? The balls all melted apart when I boiled them too, so instead I took what I had left and baked at 350F for 25 minutes (just a little golden on top) and they are delicious! Light and fluffy! Mine didn't come apart in the water, but they were just kind of waterlogged and unappetizing looking. And they never floated either-- just sank and sat there until 3 mins passed and I fished them out. I wonder if some of the people who had problems with them coming apart used too vigorous a boil-- that will make anything come apart. They were also too moist and heavy for my 1 year old to use as finger food. One light squeeze in her hand and it would have been spinach ricotta mash. SO, I took a cue from some of the other commenters and baked mine at 350 for 20 mins and they came out MUCH better. I think that the author should consider making baking the preferred method for this recipe. There isn't enough flour and there is no baking powder in them to act like regular gnocchi and puff up and float to the top. 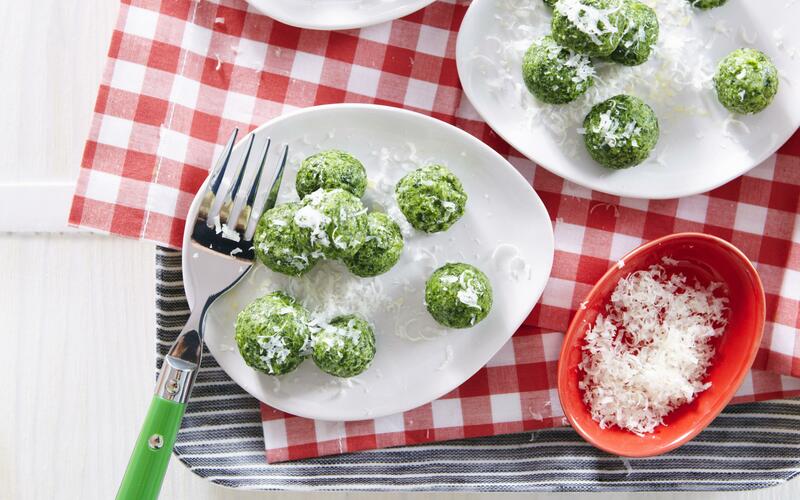 They're basically spinach cheese balls, which you would not boil in any other recipe. Put 'em in the oven and you've got a major winner. My daughter ate them up. I made these and they didn't come out great. I'm almost thinking it would have been better to pan fry them or baked. Once in the water, they fell apart and disintegrated. I don't think this was a very successful recipe. Going to make these with tofu instead of ricotta and bake per comments below. Thank you. I just made this and it was definitely a hit! I followed the recipe in terms of ingredients but changed it a little when it came to actually cooking them. I formed them into balls and then popped them into the fridge for an hour, then boiled as the recipe says. Afterwards, I couldn't see how baby could eat them with her hands so I rolled them in panko and parmesan and broiled on each side for 3 minutes. They are awesome!